Are you looking for a luxurious house that you can move into right away? Visit us at our model home to get more information about our Quick Move Ins. Many of our residents come to St George for 300 days of sunshine but move to Entrada for the incredible lifestyle opportunities. Signature Design 18-hole championship private golf course weaves through ancient black lava flows and meandering streams, stretching across 7,085 yards. Entrada is host to many community events. Follow the links to see a calendar of events. 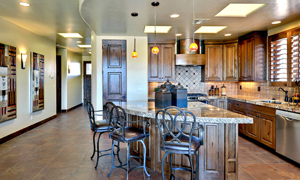 At Toroweap at Entrada we believe in building relationships while we build homes. We don’t disappear after the sale and we offer a builder’s warranty and an optional Extended Warranty to provide peace of mind and commitment to our customers. Many of our residents come to St George for 300 days of sunshine but move to Entrada for the incredible lifestyle opportunities. Call us at 435-574-1128. We are always available to discuss questions about building your new home. A.J. Construction has built custom homes all over Washington County but some of his favorites are right here in Entrada. Bathrooms that are only dreamt of are now your reality. Your dream bathroom is now standard. Get the Master Suite you have always wanted, right where you want it! Get inspired while hosting dinner parties or while dining with your family.